Italy’s IK Multimedia have impressed us in recent years with their seemingly endless string of new products for iOS musicians. It seems like there are new products, gear and accessories for iPhone and iPad users on their website every time we look. and recently they have even announced Android support for some of their products. One device they released last year has become part of our everyday carry so we thought we’d take a closer look at it: the iRig Mix. The iRig Mix is basically just what it looks like, a tiny analog DJ mixer with all the controls and features you need to rock a party. Just like a ‘real’ DJ mixer, it has two 1/8-inch stereo line inputs for connecting iPhones/iPads or other audio sources and one 1/4-inch mono instrument input for plugging in a guitar/instrument or a mic, an RCA stereo master output to the PA and a stereo 1/4-inch headphone out. Each input channel has a gain trim, two-band EQ, and a full-length volume fader and there is a crossfader. It can also be powered off USB, so you can run it off your laptop or a convenient USB power adapter like your iPhone uses already. So in the most obvious case you might use the iRig Mix as a simple DJ mixer, plugging an iPad or iPhone into each channel and mixing back and forth by yourself or taking turns with friends. DJing on the iPad can be fun but let’s face it–the lack of physical control of your tracks doesn’t always make for the best DJing experience. The iRig Mix helps a lot in this respect as it offers full-sized physical faders and a crossfader for mixing. Even if you only have one iOS device, you can use one of the supplied cables to split your output into two mono signals and DJ that way in a pinch. So while it might not be the impressive pro setup you want to use to spin at your next big DJ gig, for a party at home or by the pool it can’t be beat, and it is admittedly pretty awesome to have a DJ mixer that you can literally throw in your bag and take anywhere. 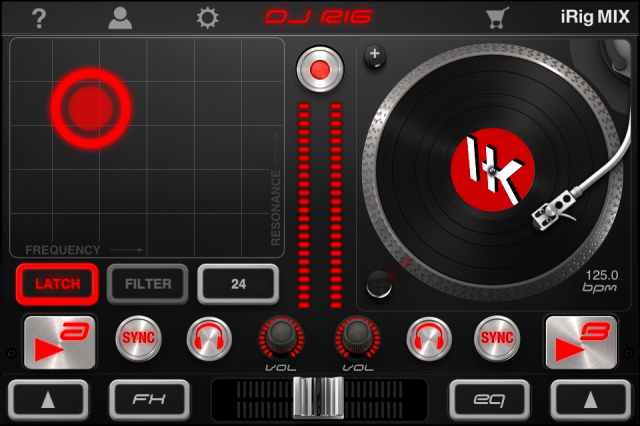 IK has also put together a nice DJ software package with their DJ Rig (a free lite version of which can be downloaded from the App Store), offering a decent selection of effects and EQ options as well as a clean graphic layout and access to iTunes for music organization. DJ Rig even allows for tempo matching (“X-Sync”) with an external sound source and the ability to split the audio output so you can use one iOS device to send audio signal to both channels of the mixer. 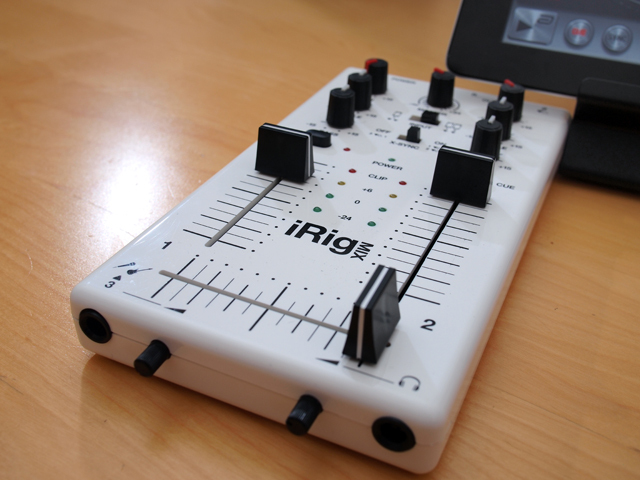 However it should be noted that you’re not limited to using DJ Rig: the iRig Mix will work great with any DJ or music software (including for example Native Instruments’ new Traktor DJ iPad app), it is at heart just a tiny two-channel DJ mixer. Even though it is convenient, there are also disadvantages of such a small mixer, especially for DJing. Working with the knobs and faders can be a bit fiddly and sometimes you worry that you will accidentally hit the wrong EQ knob. I wouldn’t try any advanced quick crossfader cuts on here either, you might knock the whole mixer off the table and into the pool if you get too excited. However there are other creative uses for this tiny workhorse that recommend it for the laptop musician. For example, one thing that came to mind the first time we saw the iRig Mix was using it as a performance mixer for live PAs. Many laptop musicians are used to playing live with just a computer + MIDI controller + audio interface setup, but in many situations you may still want a real analog mixer with volume fader + EQ at the end of the chain, just to adjust the master volume if necessary while playing and to give a buffer between your audio interface and the main PA. In this case you aren’t going to be working with the mixer that much during the performance or using it as a controller, it’s just serving the purpose of a line mixer. In addition, the iRig Mix has another clever feature that makes it useful for live performers: it allows you to use your iPhone or iPad as an effects processor on an incoming signal. 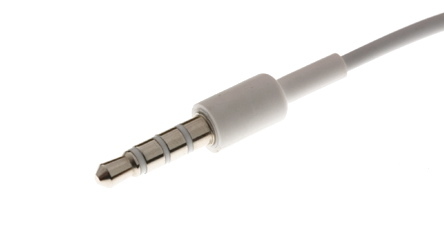 The primary use for this three-ring cable/connection is to enable audio input for a microphone on earbuds or a headset, so you can talk and listen at the same time while talking on the phone. But this connection can also be used as an input channel for recording or effects processing, a feature utilized by apps such as Moog’s Filtatron and IK’s AmpliTube. This allows you to use the left channel of the iRig Mix as an effects processor bus by plugging your input source into the 1/4-inch input at the base of the mixer, and then plugging your iPhone / iPad into the top of the left channel with the special cable. Then just run some effects software on your iOS device and you’re off. 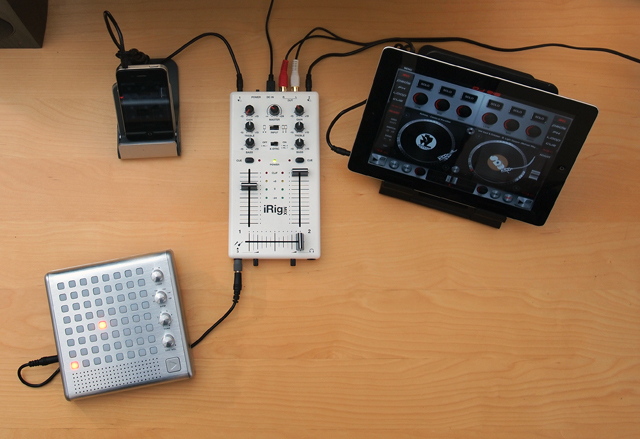 In this image we’re using the iRig Mix both as a mixer and effects processor: we’re playing tracks from DJ Rig on the iPad at right (connected to the right channel) while at the same time running Moog’s Filtatron as an effects processor on the incoming signal from the Bliptronic 5000 synth connected to the left channel. Of course you could also do the same thing with a mic or guitar connected to the iRig Mix instead of the Bliptronic, giving you an incredibly compact and versatile effects for performance or recording. Using an app like Echo Pad or GrainProc can give you some really interesting possibilities as far as realtime touchscreen control of effects. Dubspot blog editor Michael Walsh is a gadget geek, journalist, music producer, and Dubspot instructor. He believes in open-source ideas and advancing the evolution of music by sharing ideas that push technology in new directions. As a catalyst and curator for electronic music, Michael was co-founder of the Ritual Recordings house imprint, helped launch a series of turntablist records with Berklee School of Music, and has been a DJ for events including outdoor festivals in Nova Scotia, fashion shows in New York, and elite clubs in Russia’s Far East.